Contrary to common advice, soon we may be advised by health professionals to avoid milk consumption to prevent bone fractures. This is due to a Swedish study published in The BMJ last month where the dietary habits of over 60,000 women and 45,000 men were examined over a 10-20 year period, including how often they consumed various types of dairy products. The researchers looked at the correlation of hip fracture incidences and mortality rates to milk consumption. High milk intake was associated with higher mortality in one cohort of women and in another cohort of men, and with higher fracture incidence in women. It’s thought to be due to the presence of D-galactose, where milk is the main dietary source of this sugar. Other studies have shown that even low doses of D-galactose induce symptoms such as oxidative stress damage, chronic inflammation, neurodegeneration, decreased immune response, and gene transcriptional change in animals which all contribute to shortened life span. 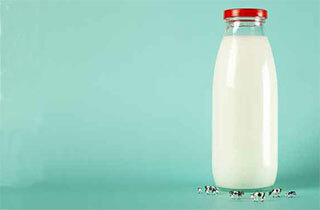 Further investigation is required to determine whether the increase in mortality and fracture is directly caused by the extra intake of milk or simply a trend, with other factors responsible for the outcomes including weight and alcohol. However, the size of the study should provide pause to previous recommendations about drinking more milk if you are at risk of osteoporosis. Interestingly, cheese, yoghurt and other fermented dairy products did lead to lowered incidences of bone fracture.